To start off our first full cultural day, our tour guide Ms. Lee gave us a brief history of the culture and beauty of South Korea to prepare us for the days various activities. 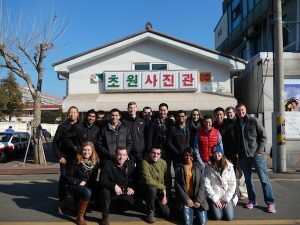 The morning began with a walking tour of the city of Gunsan. Our first stop was at a Buddhist Japanese-style temple: Dongguksa Temple. 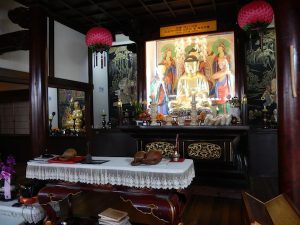 Last of its kind in Korea, this temple contains relics from the 1920s and 1930s. It was first opened in 1909 during the Japanese imperialism. Interestingly, the temple is not to be used for worship, but for self-reflection to repent and apologize for previous actions. Visitors can prostrate 108 times to reflect upon the 108 sufferings described by the Buddhist culture. Several of the GLCM students decided to attempt the movement of the prostrate. The temple is filled with paper lotus flowers, fish to represent Buddhism, and the wheel of life to represent reincarnation. We then walked over to one of the most famous Japanese style houses. 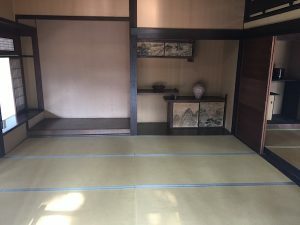 It took three years to build this house because it uses only materials brought over from Japan. Even the cedar trees outside the house in the front garden, a trait of Japanese houses, were imported from Japan. 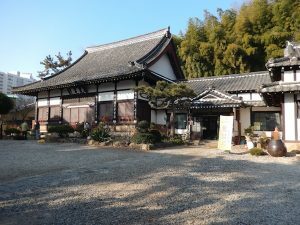 The maze-like house was once used by samurai, but now is more known for the plethora of movies that were shot here. Our next stop was also famous for being a shop that was prominently seen in a movie. Inside, visitors could watch scenes from the movie, see photos from iconic scenes, as well as take photos in front of a green screen. We ended our walking tour at the Gunsan Modern History Museum. Outside, GLCM students partook in the cultural games of a variation of hacky sack and a game where players throw a long stick into a bucket. Inside the museum, we were greeted by the slogan of “There is No Future for a Nation Who Has Forgotten Their History”. 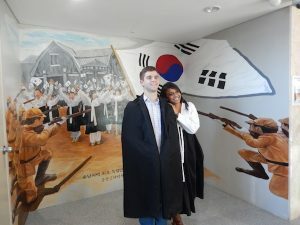 We were able to embrace the Gunsan culture by exploring and interacting with the different parts of the museum, especially with the Ocean Distribution History Hall and the Modern Life Hall. We headed over to Jeonju City that is known for its delicious food and music performances for lunch. The streets were full of people selling street food and souvenirs. It was very easy to get caught up in the culture and festivities surrounding us. Several people went to find bibimbap while others went to eat pork sandwiches. To work off the delicious meal, we all went up a hill to get a better view of the town. After several photo shoots on the hill, we all decided it was time to try the street food. 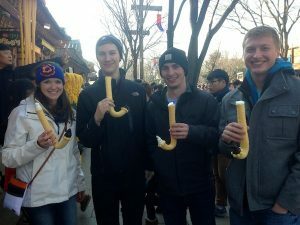 Many of us got ice cream in long, curvy cones made from corn, but some were adventurous enough to try deep-fried squid! The visit to the city was definitely a memorable experience and a lot of fun. 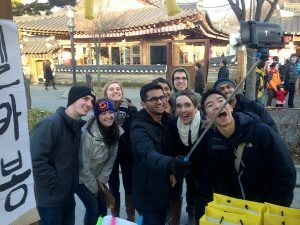 We were able to truly embrace ourselves around the Korean culture. After several hours, we all boarded the bus with plenty of souvenirs, jewelry, full stomachs, and several selfie sticks!